This is a 35mm slide of a broadside entitled "True Sons Of Freedom." In the foreground, African American soldiers fight German soldiers in World War I. The inscription to the left states, "Colored men the first Americans who planted our flag on the firing lines." Gold stars appear above two of the men. 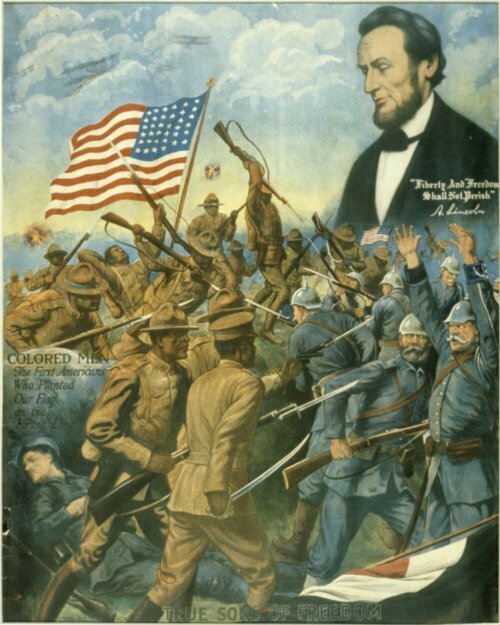 Abraham Lincoln is pictured in the upper-right corner with his famous quote, "Liberty and freedom shall not perish."